A man who commits a crime and is found guilty or settles for some sort of shortened sentence still needs to serve his time these days, right? 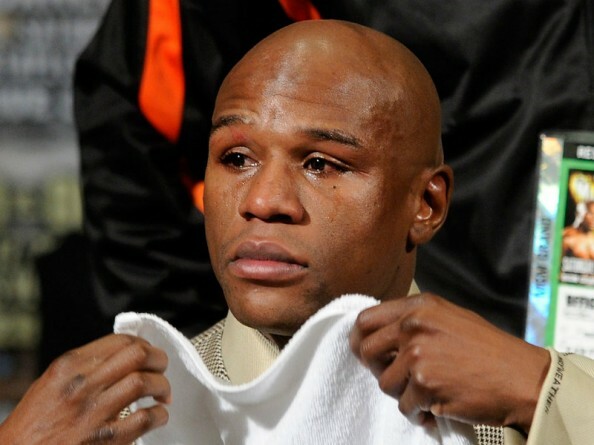 Well, Floyd Mayweather already delayed his first prison date due to his importance in the wheels of the Nevada and Las Vegas economy so he can fight Miguel Cotto. Now his lawyers want to get him out of prison so his career won’t be ruined. In perfect timing with Manny Pacquiao’s joke of a loss to Timothy Bradley, news of Mayweather’s rough time in prison, where he’s isolated from the rest of the inmates, spending his 87 days in solitary confinement. That kind of jail time, according to his attorneys, might mean the end to his boxing career. The conditions, according to his lawyers? He gets by on 800 calories a day, instead of the 3000-4000 he’s used to. He doesn’t get to drink bottled water like he prefers, and has a problem drinking tap water. He get about two periods of 30 minutes a day to work out outside his cell, while his 7 by 12 feet ‘room’ is barely enough for push-ups and sit-ups. The prosecution paint a different picture, saying Mayweather is not working out by choice and denying much of the food offered to him. He has the ability to exercise, he just chooses not to. It’s jail. Where did he think he was going? The Four Seasons? Mayweather’s personal physician, Dr. Robert Voy, visited him last Friday and was concerned that the fighter has been losing muscle tone, but has also risen concern regarding Mayweather’s mental and emotional state – I am concerned about Floyd withdrawing, developing anger he cannot dissipate through the usual means of dedicated exercise and training. Boxing has been Mr. Mayweather’s life since he was a young man and we need champions of this type to continue to their natural retirement and hopefully their contributions to society thereafter. Again, the prosecution is not impressed, insisting Mayweather finishes his alloted three months in prison which he has already dodged once. They keep chipping away, chipping away, chipping away, trying to soften the sentence. Mayweather’s lawyers, according to them, aren’t looking for special treatment, they’re looking for fair treatment. A judge will discuss the case next week and will decide if Mayweather is to be released and serve the rest of his sentence under house arrest, not necessarily in his mansion but another apartment or less luxurious home. As if anyone is surprised by this. As if anyone will be surprised if Mayweather gets to walk out and spend the rest of his time at a more comfortable spot, despite being sentenced to jail. The man means money to the local economy, and that may be enough to push the right buttons and let him off the hook, once again. Maybe not for the last time.